Post: Gaurav Akrani. Date: 6/26/2010. Comments (2). Label: Management, Study Notes. Frederick Herzberg's theory of motivation is also called 'Two Factor Theory', 'Dual Factor Theory' and 'Hygiene / Maintenance Theory of Motivation'. This theory is based on the information collected by him and his associates (in the USA in 1959) by interviewing two hundred engineers and accountants. The information collected relates to the attitude of people towards work. This attitude towards work depends on two sets of factors namely hygiene or maintenance factors and the motivating factors. According to Frederick Herzberg, the Hygiene Factors do little contribution to provide job satisfaction. He called them "dissatisfiers' as their absence cause dissatisfaction but their presence is not motivating but only prevent dissatisfaction. The hygiene factors meet man's needs to avoid unpleasantness but do not motivate them to take more interest in the work. Hygiene factors (when provided) create a favorable environment for motivation and prevents job dissatisfaction. They are not an intrinsic part of a job, but they are related to the conditions under which a job is performed. When employer is unable to provide enough of these factors to his employees, there will be job dissatisfaction. However, if they are provided, they will not necessarily act as motivators. They will just lead employees to experience no job dissatisfaction. Such hygiene factors are as noted below. Motivating factors motivate subordinates to take more interest in the work. They raise efficiency and productivity of employees. According to Frederick Herzberg, motivating factors are essential in order to provide job satisfaction and in order to maintain a high level of job performance. Employees will not have job satisfaction if the motivating factors are not provided in sufficient quality by the employer. According to Frederick Herzberg, these two sets of factors are quite independent of each other. It may be noted that hygiene factors, when satisfied, tend to eliminate dissatisfaction but do not motivate an individual employee for better performance. The motivating factors will permit an individual to grow and develop in a natural way. In brief, hygiene factors affect an individual's willingness to work while motivating factors affect his ability and efficiency to work. This theory can be compared to Maslow's theory of human needs as both the theories refer to needs and their role in motivation. In addition, the assumptions in both the theories are identical. 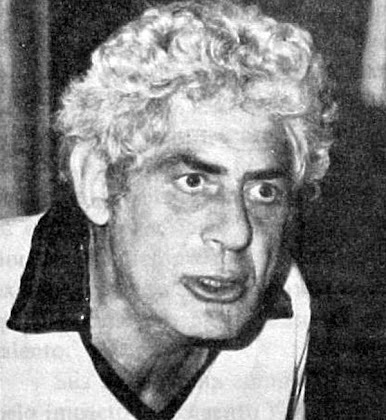 Frederick Herzberg's theory has many limitations. They are related to research methodology used, empirical validity and assumptions in the theory. His theory is criticized on many grounds. Many have found the theory to be an oversimplification. Despite such criticism, Herzberg's two factor theory has made a significant contribution towards improving manager's basic understanding of human behaviour. His theory is simple to grasp, based on some empirical data and guides managers to improve employee motivation. 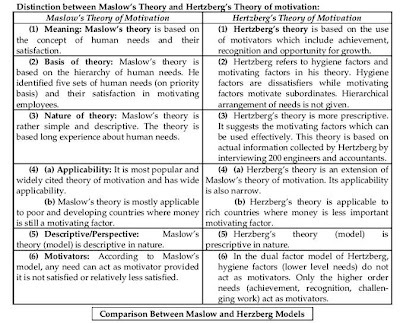 Herzberg provided stimulus to other researchers to develop alternative theories of motivation. 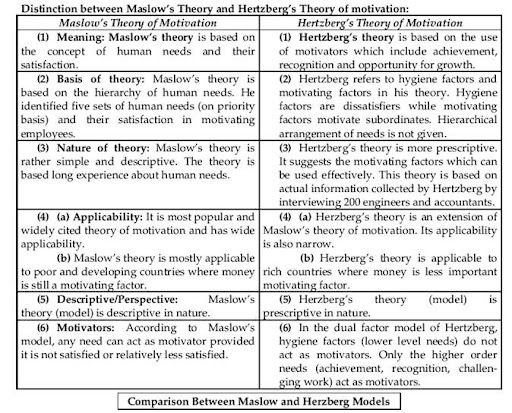 Distinction between Maslow and Herzberg's Theory of Motivation. thanks for this post as it has helped me in my findings for my term paper.